Do nation-states have a “Responsibility to Protect”? After the United Nations arose from the ashes of the Holocaust, the world's collective vow “Never again” seemed ironclad and irrevocable. As part of its effort to prevent future wars and genocides, the U.N. began to station peacekeepers around the globe, beginning in 1948 in Jerusalem. 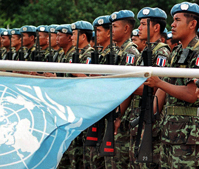 But the peacekeeping missions have had limited success. Now, prompted by the horror of the killings in Rwanda and Darfur, and before that in Bosnia, the world body has adopted a controversial new concept — the Responsibility to Protect — designed to stop future catastrophes. Known as R2P, it holds that the world community has a moral duty to halt genocide — even inside a sovereign country. But detractors call R2P legal imperialism, and even its defenders admit that the rhetoric has not yet translated into meaningful aid for Darfur. Other international alliances, meanwhile, have stepped up to provide military muscle to keep the peace in other hotspots, including NATO and the European and African unions.